« GOTY Grace Debut At The AG Store!! The other day, my mom sent me this and I just thought it was so good! It gave me inspiration and literally made me want to start playing! I am really Old and each year I start making all my own toys but by the end of the year my Old Old Mom says I have to many to keep and I am spoiled so she makes me give them all away. I don’t know what all the people I give them to do with them but at the end of the year they can’t wait for my MOM to make me give all my toys away again. 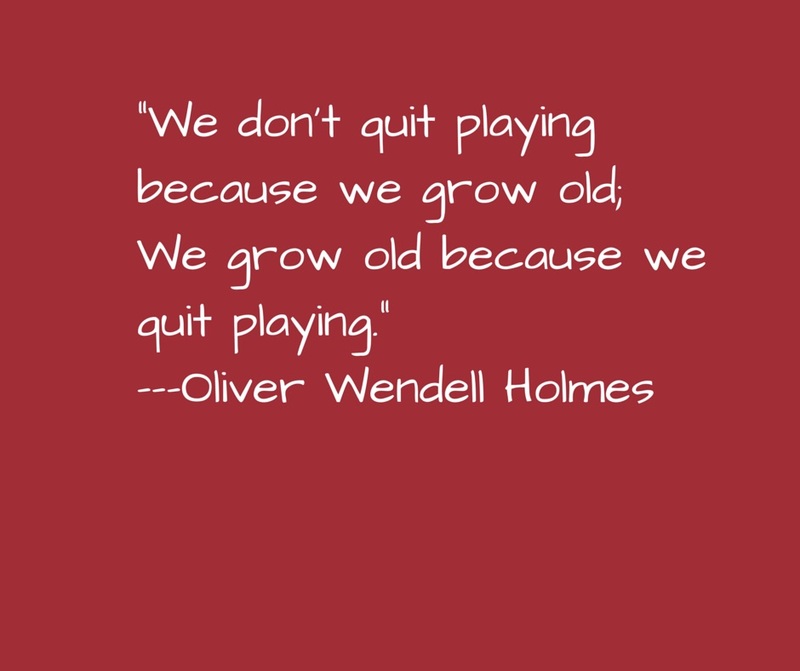 You made a great point in this post–it’s not that you quit playing with them but how you play with them changes. You can continue to enjoy them in different ways! Keep on having fun with your blog, you do a great job. As I say, you are never to old for dolls (or toys)! My mom had a huge Barbie collection when she died–she was 89! I totally get what you mean! I am almost 15, and don’t get me wrong, I love my dolls, but sometimes I just feel drained of imagination, and don’t know what to play! I really like that quote, and it makes me want to start playing too! I’ve been the same way recently. While years ago, I could make up stuff with my dolls for 5 hours straight. Now I sew for them, do photo stories with them, stop motion, do their hair, craft, do everything but make up stories for 5 hours straight with them. It’s not nearly as hard as doing it with barbies, but I can get bored more easily sometimes then I can when I am stop motioning. My parents want to get rid of our Little People. My brother and sister don’t mind but I do. They say I’m too old to play with Little People (I was obsessed when I was 3) but I love to play with them once a year, like you. Barbies, TBH, I could do with less. We have so many blond ones, mainly blue-eyed that get on my nerves every time we play with them. Most of them are my sisters, though…. Oooooooooooh! I like that! I think I will pin it to my doll’s space! Heehee, my friends started a Neverland Lost Girls club, and you have to still play with your old toys, and we can’t talk about school or anything like that while we see each other. It’s rather fun. Haha, I’m the same way. I KNOW! It’s really annoying to grow up sometimes…. I played with them the other day. They are so cute and teeny tiny. It’s like the older you get the more pink (which I didn’t mind growing out of) and dolls and playing and rainbows and butterflies and ladybugs and fairies and all are shunned. 😀 It drives me nuts! 😀 😀 😀 😀 😀 😀 😀 😀 😀 😀 😀 😀 Haha, someone needs to make a message board or something of that………..I would totally join! If I were allowed to, that is. I have been feeling…embarrassed to play and talk about dolls in front of people, even my friends and family. Even when I went to AG a few weeks ago, a employee was surprised I still played with dolls. That quote is really helpful, thanks. I know right! It seems like only yesterday I met you in 2012on AmericanGirlFan and you were 13! Same here! Wow, almost 3 years! I think blogging is great for playing with your dolls, because I can still use them, even though I don’t play stories with them anymore. I’m almost 16, too, and I still love my dolls! 😀 Good quote. I admit that the majority of my Barbie dolls are packed away in the closet. My baby dolls are, well, that’s a completely different issue – my mom put them away in the basement and their eyes are a bit creepy now. However, my stuffed animals and my AG dolls (and Haley too) are prominently displayed in the house. The point is to enjoy your life by doing what you enjoy and collecting what you like; don’t let anyone else dictate what you should do. That picture/quote is correct. Don’t forget there are many adult doll bloggers out there…Doll Diaries, Living a Doll’s Life, Adventure’s of Steampunk Addie, and many more! And my sister,( before she became absessed with AG:-)) was a my little pony crazy girl! She still is, actually. Has anyone heard of calico critters?? They are so cool, too,. They are fuzzy adorable little animals, and all my family loves em! I have the border collies and the pigs. I loveeee them! The pigs I meant he koalas sound adorable!! My sister has tons though, like, 5 family’s, I really like the website too! Hey! My sister / and I have the burger restraunt! I can tell you, it’s real fun, but even more if you have a car to go through the drive through! Lol, but the pieces are all so little and so many that it’s sometimes confusing for when you try to sit the critters down, hahaha! It won’t let me send something for tell us tuesday 🙁 Nothing happens when I press the “Send” or whatever. I hope it lets you this time! I’m only 12, but i’m starting to feel that way. I haven’t played with my little people for ages, and my mom never allowed me to have barbies. I don’t “play” with my dolls as much, but I have always loved crafting for them, changing their clothes, doing their hair, and making scenes more. That’s my way of doll play! Please tell this to my mom and cousin lol. They say I’m to old for dolls. If it’s any consolation, I don’t even spend 1 hour playing with my dolls! 30 minuets for me, and I feel like that’s a while! That is so true!! I’m still eleven, so I still play with my dolls. I don’t want to ever outgrow my girls, that would be so sad!! I think I’ll just save them for my kids ( when I have them) 🙂 What do you think you’ll do with yours? I agree! I want to play, but it’s getting harder to play because I am always so busy. I will turn 13 next year and that is just so bitter for me. I don’t want to grow up! I want to stay 12 forever. And yes, it is hard for me to play dolls..I just feel so..old. What a great quote! Thanks Jaclynn! Yeah, now what I really do is make stop motions and do photo shoots and hair, fashion design. And I do PLAY every now and then. Guess what! my friend and her dad just gave my friends mom Josefina for Christmas! I can totally relate to this post. My story is a bit different but as a sixteen year old, I can personally testify that admitting to playing with dolls can be society awkward. When I was younger, I was more of a Lego girl. My older sister loved dolls and convinced me to play with her. We also started sewing and selling our doll clothes. And we would play hours on end imaging the doll travel the worlds and rule kingdoms. But then my sister grew out of this phase of playing with dolls and I quickly followed suit since I didn’t understand dolls really in the first place. I become too embarrassed to admit to other friends and adults that I sewed doll clothes. Then I realized that though I wasn’t a huge doll fun, I loved sewing for these dolls. I could sew everything on a small scale allowing me to create more outfits and not be afraid of failing. And through this passion for sewing I found a passion for dolls as well. I love my dolls now and through sewing and photo shooting I have found a new way to “play with them”. So I totally agree with you on this. Adult (and teens) should still be allowed to play with toys and dolls they just do it in a different way. Great post and it’s given me a lot to think on. I am 61 years old and my childhood love of dolls was rekindled after the birth of my granddaughter. She is now at an age when we can play with dolls together. I love your quote because when we dress our dolls and have tea parties all the joy of my childhood comes back and I feel young again. Thanks for sharing. I’ll never forget to remember this quote! Or that i love my dolls! Jaclynn, I had a dream that you and Emma were at my house! It was pretty cool. 🙂 You and I were going to crochet together.